This morning my puppy Dio was bitten by a rattlesnake. I’ve been dreading this possibility since I decided to spend the summer in New Mexico, and now that it’s happened, I’m so relieved. Dio is going to be fine. After our morning hike I went into the Airstream to start working and left the dogs outside to cool off on the patio. Dio must have gone wandering a bit because a few minutes later he came limping into the Airstream on three legs. I checked his right front paw for cactus spines, the usual paw-injury culprit around here, but found none. His foot was hot to the touch and when I ran my hand down his leg I came away with two small streaks of blood. Uh oh. I grabbed my first aid kit and gave Dio two 25 mg tabs of benadryl right away (1 mg/ #) to help keep down the swelling. I also gave him a dose of rimadyl – a doggie painkiller – that I had left over from one of Bowie’s recent minor mishaps. And then I set about keeping him calm and quiet, arguably the most important step of rattlesnake first aid: the more stressed and active your dog, the faster and further the venom will travel through its body. All morning and afternoon, Dio hung out under my bed (his favorite place) and I sat next to him on the floor. Every 15 minutes or so I offered him water with a splash of chicken broth to entice him to drink. Keeping your dog hydrated after a rattlesnake bite is paramount. If he had stopped drinking or started having trouble breathing or seemed in distress at any time, I would have rushed him to the vet. But other than the swollen foot, he showed no signs of trouble. Dio is a little bit of a special case. 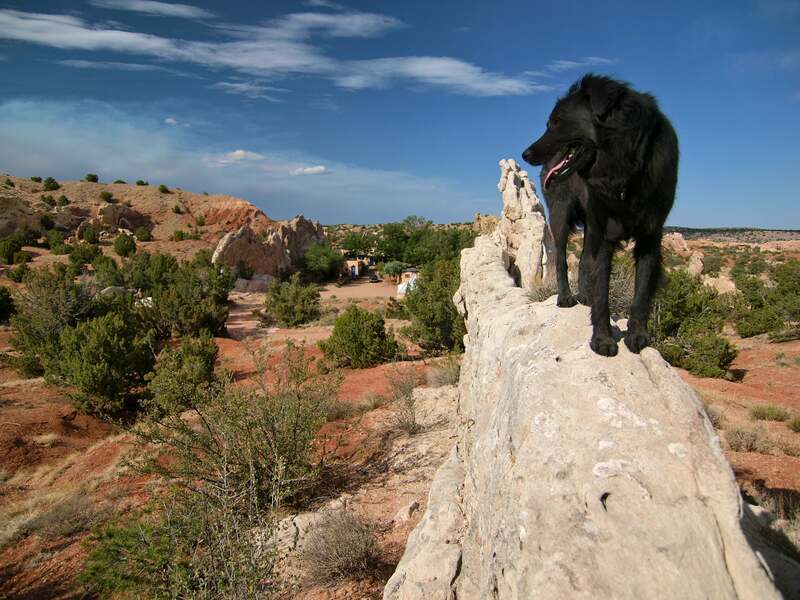 Two years ago, I found him – or he found me – on a hiking trip on the Navajo reservation near Monument Valley in northeast Arizona. He was mostly wild and in terrible shape and it was obvious he had been living on his own out there for some time. He wouldn’t let me touch him but he bonded instantly with Bowie and followed us several miles back to my car and hopped right in the back seat. It took about a month until I could pet him without him flinching and more than a year until he got over his fear of other people, especially men. I don’t think he was ever really abused. I just think he was never handled; he was never anybody’s pet before I found him. So Dio’s a pretty tough dog and smart enough to survive on his own in a waterless, desolate place. He was probably about 6 months old when I found him and it’s entirely possible he encountered a rattlesnake at some point. When I took him to rattlesnake aversion training he wouldn’t go near any of the snakes. Once dogs have been bitten, they can develop some resistance to the toxins in the venom, though this isn’t always the case. I think he was probably bitten today out in the garden. 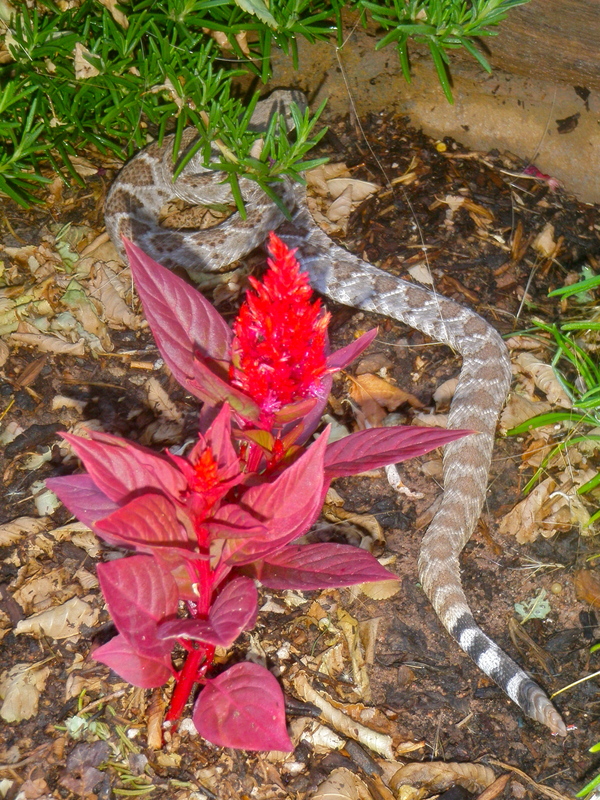 He seems to know better than to pester a snake – most curious dogs get bitten on the face – but he does like to graze on the green grass and I can imagine a snake curled up deep in the grass striking at his foot. I kept the other two dogs inside most of the day and poked around in the gardens with my snake stick, but found nothing. My neighbor Julian is a bit of a natural supplements guru and he stopped by several times with different remedies: Bentonite clay to help absorb toxins, electrolytes to help balance his blood chemistry and chlorophyll to help settle Dio’s stomach. I also started him on antibiotics (since I’m on the road so much I always keep a stash of antibiotics on hand for me and the dogs) to combat any infection from the bite. A few weeks ago, my neighbors’ rhodesian ridgeback was bitten by a rattlesnake right on the nose and when she began having trouble breathing and drinking, they rushed her to the vet. Their vet did not recommend antivenin (often mistakingly called antivenom) because a lot of dogs have a severe reaction to the antivenin itself. It’s also really expensive: $500-1,000 a dose depending on the size of the dog. Instead they gave her IV fluids, antibiotics and pain meds and kept her for 36 hours of observation. Their bill was $400. As long as Dio keeps eating and drinking and breathing and acting normally, I won’t take him to the vet. Dio has come a long way from his wild days in the desert, but being put in a cage and poked and prodded by strangers will totally freak him out. I’ve done just about everything for him a vet would do: benadryl, pain killers, antibiotics and round the clock observation. His foot is still swollen but the swelling hasn’t traveled up his leg and he’s walking on it normally. In fact, this evening he saw a couple of coyotes on the cliffs behind the house and took off after them. Crazy mutt. Let’s keep our desert living hazards to one at a time, please. Update: It has now been more than 48 hours since Dio was bitten and I think it’s safe to say he’s out of the woods. His leg and foot are almost back to normal size and the wound itself is healing nicely, with no signs of infection. I’ve been keeping up with the benadryl (2 tabs twice a day), antibiotics and pain meds and have been soaking his foot every couple of hours in a mixture of betadine and epsom salts. A friend told me that when her dog was bitten on the leg, the leg turned black and she and her vet seriously discussed amputation. Her dog pulled through with a dose of antivenin, but it was touch and go for several days. Dio’s case has been pretty much the best case scenario. If you’re reading this looking for advice on what to do, please don’t gamble that your dog will pull through without veterinary care! I have veterinary training and more medical supplies on hand than the average dog owner. Here’s hoping this will be my first and last snakebite rescue! 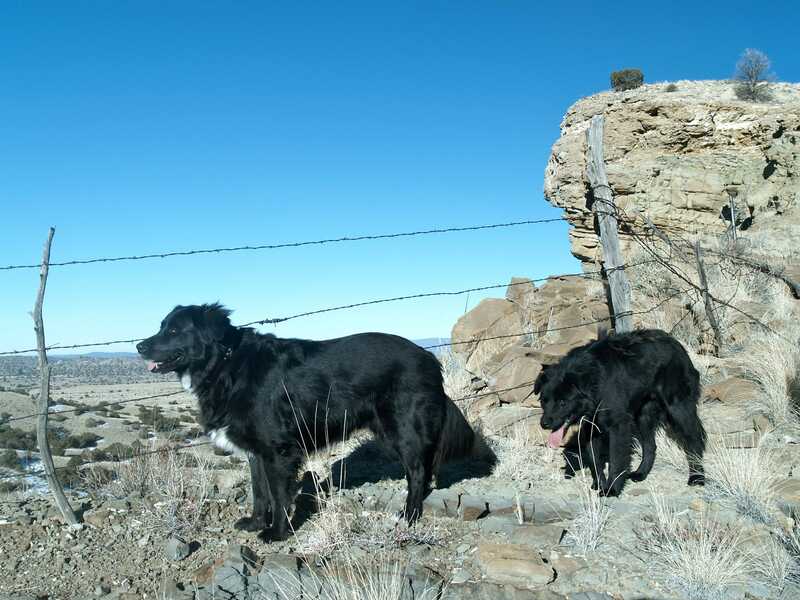 This entry was posted in Bowie & D.O.G., Hiking!, New Mexico and tagged bite, desert, dog, first aid, rattlesnake, treatment. Bookmark the permalink. 11 Responses to Rattlesnake vs. D.O.G. I’m so glad Dio made it! A very lucky puppy. I still vividly remember when, years ago, our puppy, Topolino [http://www.fotocommunity.de/pc/pc/extra/egallery/pcat/381897/display/11868307], didn’t make it. The rattler really got him in a leg muscle, and he must have moved soem so that the venom could really spread. Moreover my wife wasn’t abel to immediately rush him to the vet, who tried everything he could, but to no avail.